Q: What happens to my manuscript after I send it to Paper Editing? Initially, you will receive a receipt acknowledgement by email alongside a quote that will have been calculated on a cost per page basis depending on the service you asked for when you uploaded the paper. If you are satisfied with the quote, then please contact us at papers@paperediting.net for Payment details. If you are unhappy with the quote, then please inform us by email as soon as possible. After we have received the payment, we will perform a check on the subject area of the paper and send it to a subject-specific editor whose qualifications/editing experience are closest to the subject area of the manuscript. 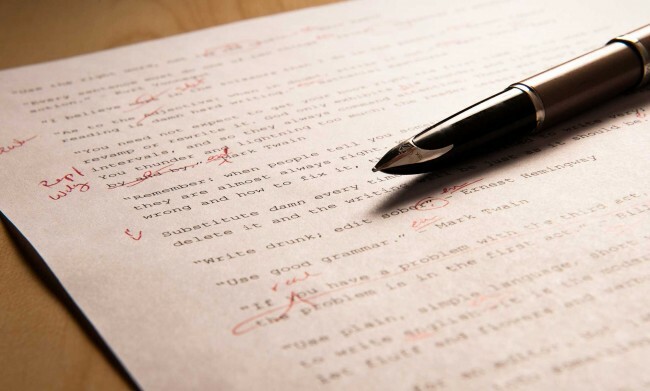 After the manuscript has been edited by the subject-specific editor, it will be checked again by one of our in-house English language editing experts who will make sure that there are no remaining errors in the grammar, spelling, or English usage. Finally, you will be informed by email that your manuscript is ready. All editors at PaperEditing have signed a legally-binding confidentiality agreement in which they agree not to divulge the content of any manuscript to anyone else or use it in their own work. Q: How are editors selected? Additionally, editors must show a consistently high level of quality editing over a three-month period before becoming permanent members of the Paper editing team. Q: What document formats does PaperEditing accept? All manuscripts must be submitted in MS Word format (all versions, including RTF and MS Word 2010) or in simple text format. We also accept open office documents if you are a linux user. We are currently working on accepting LaTex Documents. You can pay for the English editing of your paper, by cheque, bank transfer or Western Union Money Transfer. Therefore, you will be supplied with details about how to pay by bank transfer or cheque in the email containing the receipt acknowledgemenet for the paper. Q: Will I be charged VAT? All our invoices are exclusive of VAT. Q: What types of work does PaperEditing edit? We edit and proofread all types of documents, including manuscripts, papers, reports, theses, publicity, presentations at international conferences, and dissertations. Q: What about tables and figures? PaperEditing will edit the English of all files containing tables, figures, and indeed any accompanying material as long as it is accessible to word processing. This usually excludes files in PDF, TIFF, GIF, and JPG formats, but includes PowerPoint and MS Excel files. However, these files, if available, should always be uploaded with the paper as having access to the data helps us to better understand the text and to check for consistency between the text and the data. Q: How will I know when my manuscript is ready? You will receive an email informing you that the paper has been edited and is available and your manuscripts will be attached to it. Q: Do you operate a discount scheme? Yes, we do. You will be issued a 10% discount token every time you refer a friend or colleague to our website and he/she accesses any of our services. This is the number that will be e-mailed to you as soon as the reference is confirmed. Each token provides a 10% discount on the cost of editing the next manuscript. You can combine tokens to accumulate discounts, or share them with your colleagues. Q: How will I know you have received my manuscript? An automatic receipt is sent to your email address immediately after we receive the document(s). The receipt will be dated and will inform you of the date on which the edited version will be available. Q: Will I receive a quote? An email containing a quote will be sent to your email address, usually within 5 hours after you receive the receipt acknowledgement for the manuscript. You will be given details on your preferred method of payment alongside the quote. If you are unhappy with the quote, please contact us as soon as possible. You will be given payment details in the quote you received by email. After the payment has been confirmed, we will start editing your manuscript. If you are unhappy with the quote, please contact us as soon as possible. Q: Will I receive a payment receipt ? Yes. You will be issued a payment receipt by PaperEditing immediately after you make the payment. Q: Will I have to pay again for the editing of revised manuscripts? The new/modified text is highlighted in the revised paper. You can use underlining or coloured fonts. The amount of new text does not exceed 10% of the number of pages of the paper originally edited by PaperEditing. If these two conditions are met, we will only proofread the new/modified text and you will not have to pay. You will receive back the edited version within 3 days. Note: You can send the same revised manuscript to PaperEditing a maximum of two times. Please accept any previous changes in the manuscript visible under MS Word "Track Changes" before proceeding to make new changes in the manuscript. If the amount of text exceeds 10% of the word count of the paper originally edited by PaperEditing or if you have not highlighted the new/modified text appropriately, then we will edit all the manuscript again. You will be charged 50% of the service fee. Q: Does PaperEditing edit responses to editors and referees? Yes, we do. Letters containing responses to editors and referees are treated in exactly the same manner as papers, and are subject to the same editing fees. Please send us the revised manuscript together with the letter, even if it is not in need of editing. If the revised manuscript is in need of editing, you will not be charged if it meets certain criteria. Q: How will I see the changes in my manuscript? You will receive back two files; one containing the manuscript with the changes visible under Track Changes and the other with the changes accepted and invisible. Track Changes is a feature of MS Word and can be accessed through the review menu of MS Word 2007 and 2010. When Track Changes is activated, all the editing work in the manuscript is visible, including deletions and insertions, and format changes. You can accept or reject changes by simply right clicking on the highlighted text and choosing the appropriate option. For a more detailed review of the â€œTrack Changesâ€� option in MS Word see here. Q: What do I do if my paper is late? If the date exceeds the delivery date in the receipt you received by email, please contact us immediately by email. PaperEditing will always endeavour to deliver the edited work before the announced deadline. If not, you will be refunded 10% of the editing fee for each day the delivery date exceeds the deadline. Note: PaperEditing will only start editing a paper after payment has been made. Please make the payment promptly to avoid a delay in the editing process. Q: What happens if Iâ€™m not happy with the work? All our work comes with the guarantee that any manuscript that has been entirely edited by PaperEditing will not be rejected for publication because of poor English. In the unlikely event that this should happen, we will continue to work with you until you are happy with the edited version.